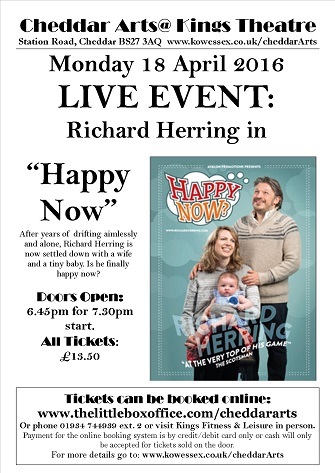 Richard Herring's Show "Happy Now?" Last week Richard Herring brought home his seventh show to a lively Cheddar Arts@Kings Theatre audience on the beguiling question of "Happy Now?" With Herring's predictably fast-thinking, fast-talking, business-with-pleasure combo brand of comedy, I imagined the Happy Now title pronounced in a whiney childlike voice (happy nowwwwww?). But this happy show was down to one particular child as Herring took us on a journey in his new role as an older dad following the birth last year of his daughter. "The happiest day" of his life and also the "most horrific." This was comedy for the broad-minded, with teasing "dot dot dots..." and "in parenthesis" comments that left little to the imagination; handy for any mum-to-be about to give birth as Herring regaled his audience with side-splitting stories. From his wife's waters breaking - when he ran her a comforting bath and then hilariously took himself to the comfort of his bed. To the taxi ride to hospital and all the gory details of the labour with what looked like a plunger to extract his screaming baby daughter; smattered with studious ideas of women in childbirth being punished for Eve pinching the apple from the Garden of Eden naughty tree. True to his craft he even considered podcasting the birth. Nappy-changing was comically compared to a love/hate Marmite affair. An unfortunate image you might perhaps think. When he nearly choked on an apricot stone, his first thought as he pictured himself about to expire, was the embarrassment for his daughter in years to come telling her friends that her dad died eating an apricot. Dark humour was also in the form of Herring's inner voice, always on the lookout for danger and destruction to his daughter. A stalagmite spear of something suspect might fall from an overhead aeroplane onto her pram. Slightly unnerving. I blame his sleep deprivation. And then in Herring's inimitable style events took a profound twist combining mirth with meaning: "Happiness is its own punishment." Pardon? The new happy daddy thinks we are always terrified happiness will go away. For him, the magic of happiness is to live in that moment of happiness, like the three year-old boy he saw on holiday with an ice cream who does not need to know his ice cream happiness will not last. So, early egocentric comic writer fears aside: "The pram in the hall is the enemy of creativity" - it was the overwhelming love for his daughter and wife that shone. Holding his daughter, watching her sleep is pure joy. A symbol of hope. He might even train her up to be a comedian. By the end of the show, it was clear Herring had found a new reason for being a dad and a comedian - to make his baby daughter laugh; as the closing footage happily showed. Happy in the now indeed.